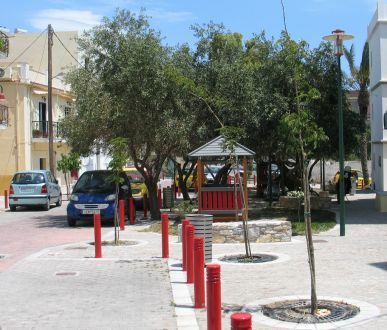 This is about a part of combined proposals for square and street reinstatements in downgraded areas of Ermoupoli, Syros. The ideal remodelling would call for use of the whole area breadth so that a functional square could be created, but the existing garage ways demand the conversion of the existing road into a light traffic lane. Eight parking slots are created on both sides of this lane and to the West. The landscaping of the new square reaches the building lines thus giving the residents the chance to have some free space in their doorway instead of parked cars. 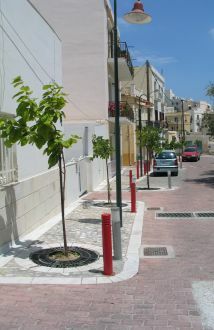 More trees are replanted adding to the existing plants. The main part of the square is lawn planted and hosts scrambling and balance game structures without a need for supervision.